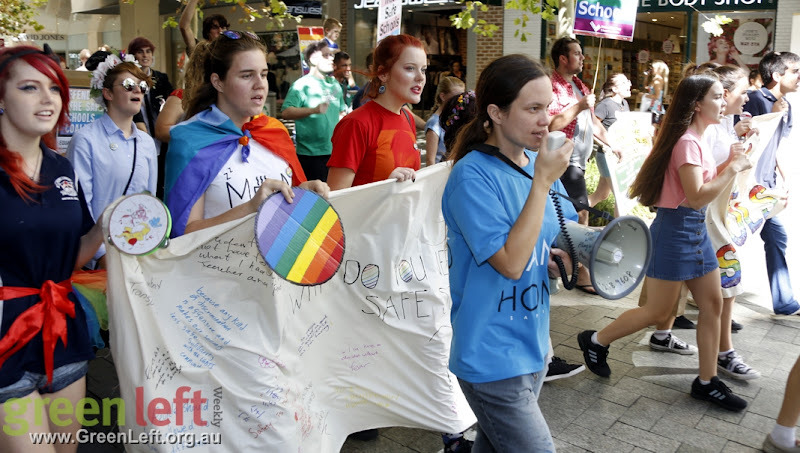 Save Safe Schools WA organised a protest in Perth on April 23. 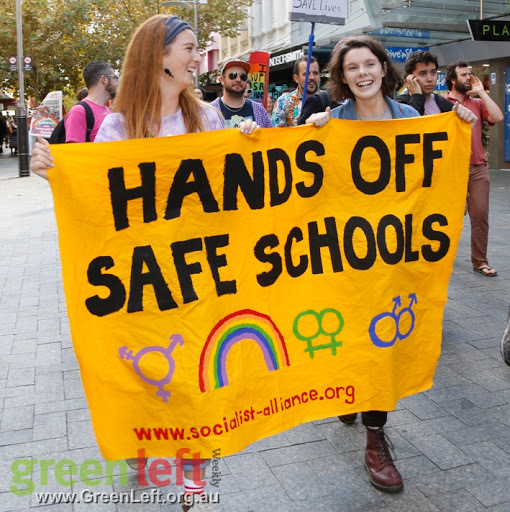 The Safe Schools program is an important anti-bullying program that began in 2010 in Victoria and has since been extended throughout the country. Many young people claim the program is responsible for saving their life. 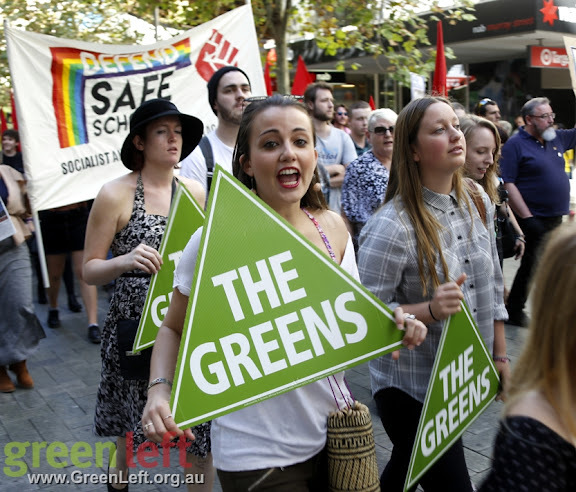 The rally organising group is a new activist campaign that formed after the highly successful demonstration the month before. 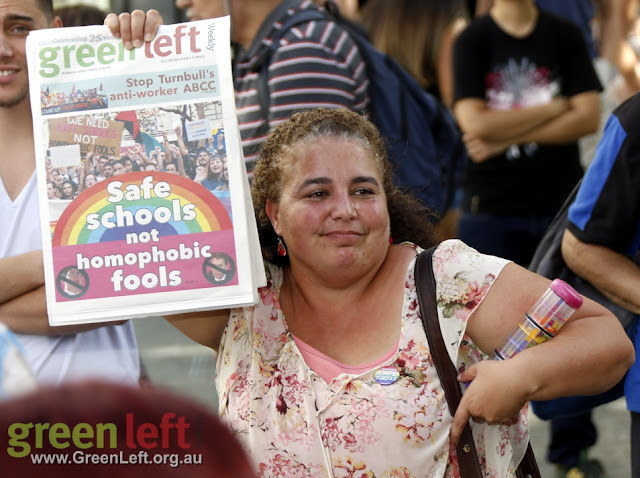 The Turnbull government is attempting to inflict devastating attacks on Safe Schools by restricting its activities and threatening to cut its funding. 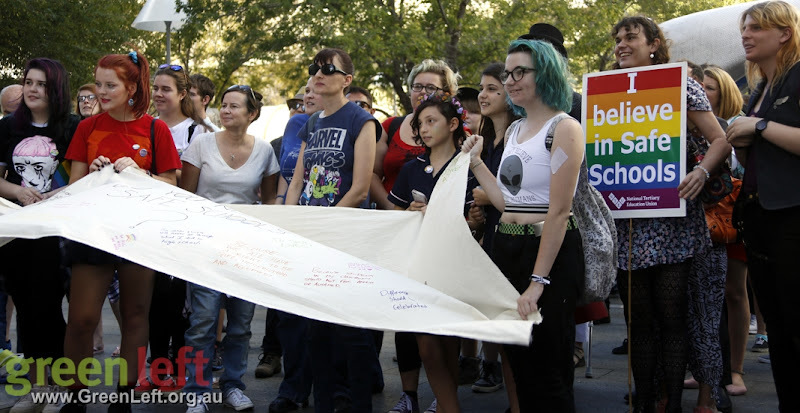 The rally (like the previous one) was a wonderful opportunity for young LGBTI people to explain why the Safe Schools program means so much to them. 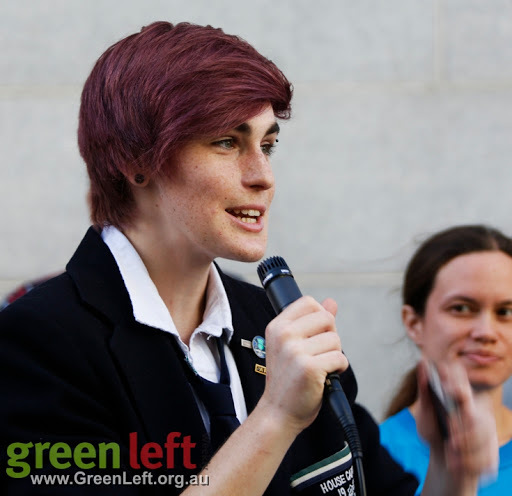 Kai Schweitzer is the creator of the "Why I need Safe Schools" Facebook page. He told young people in crowd "there is nothing wrong with you". 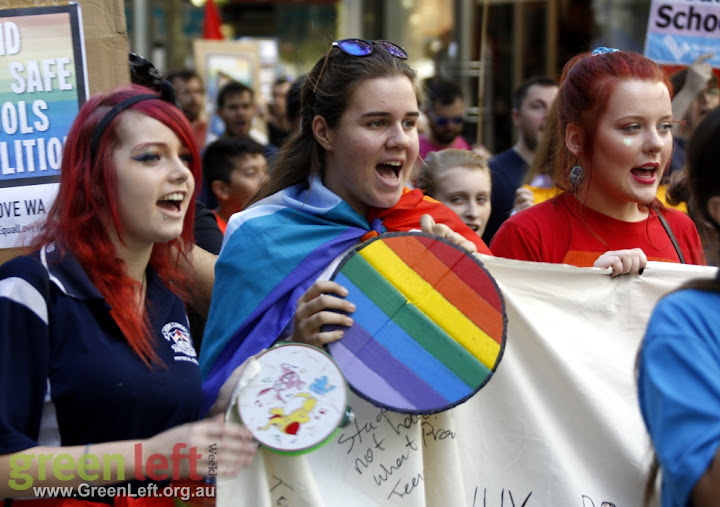 "To all the parents who have queer kids, there is nothing wrong with your children. 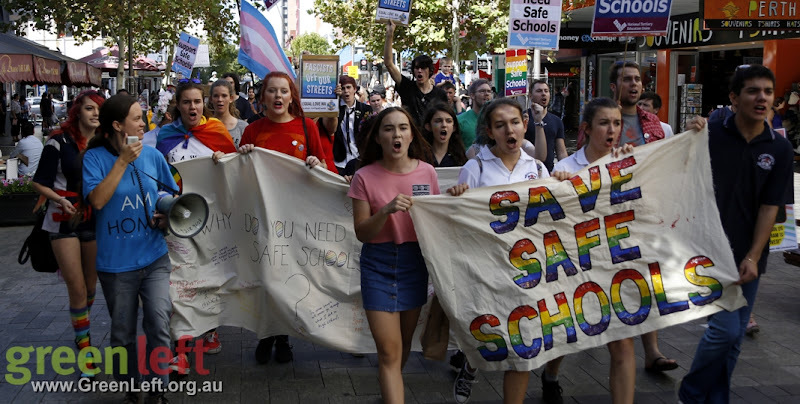 We should all be free to go to school and get an education without constant fear of harassment and that goes for the teachers too who work in schools and should be able to teach in freedom." 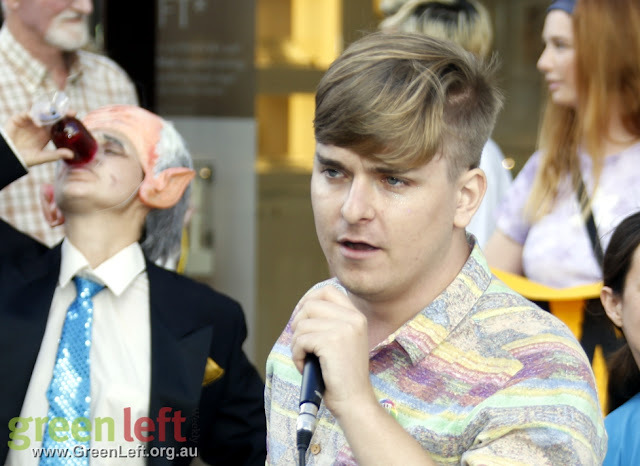 This rally was complicated, however, by a counter protest by far right Reclaim Australia. 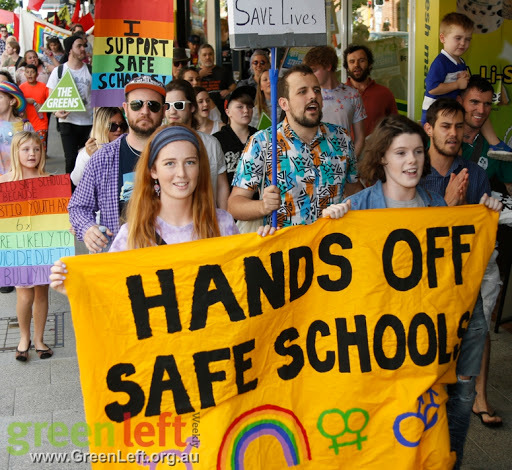 They disingenuously claimed to "support the LGBT community" but that they "draw a line when it comes to children and pushing these views at such a young age" despite the fact that this is a blatant misrepresentation of the very popular Safe Schools program. 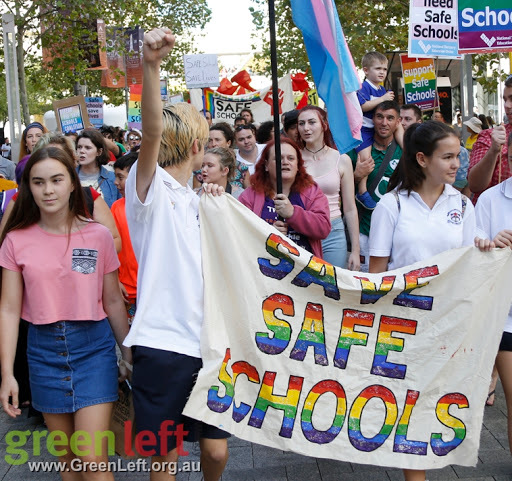 Socialist Alternative reacted to the counter demonstration by leading a split in the rally but most people stayed focused on defending Safe Schools. 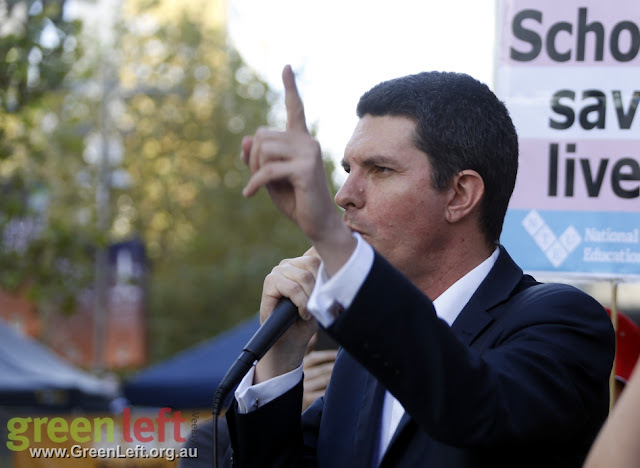 Greens senator Scott Ludlam won a mighty cheer when he called on people to make a noise to drown out the "six, angry, pointless men" in the far right counter demonstration. 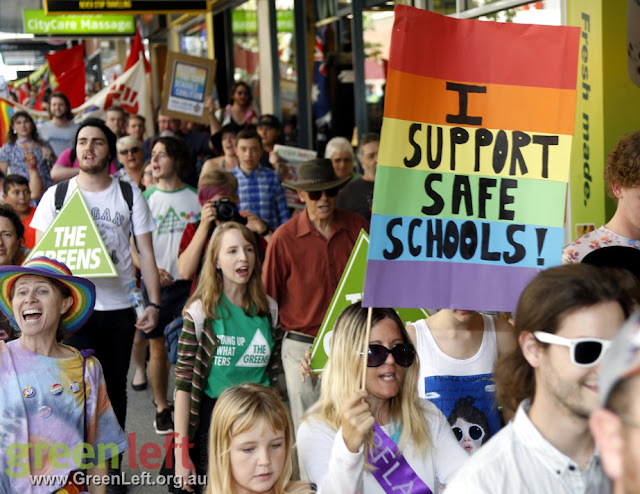 "I'm a little bit pissed off that we even have to turn up to explain the concept of Safe Schools," he told the rally. "I would have thought that was a really simple concept for people to understand." 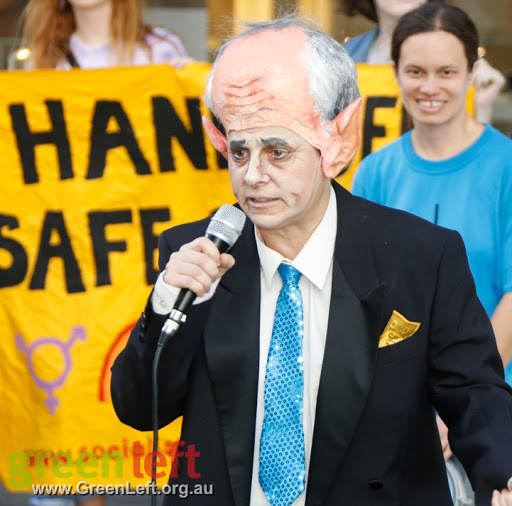 He finished with a big message of thanks and congratulations to the organising team for getting a "big, colourful, bright demonstration" together. 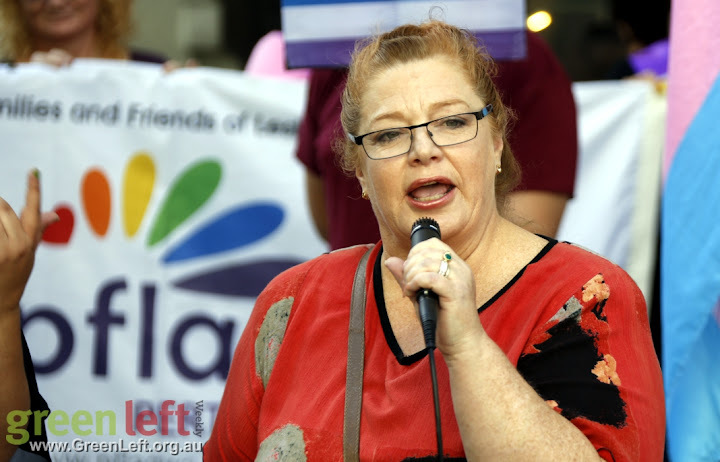 State opposition education spokesperson Sue Ellery confirmed that "if the federal government does withdraw funds from Safe School, [a future Labor state government] will fund Safe Schools so that those schools who choose to participate can". 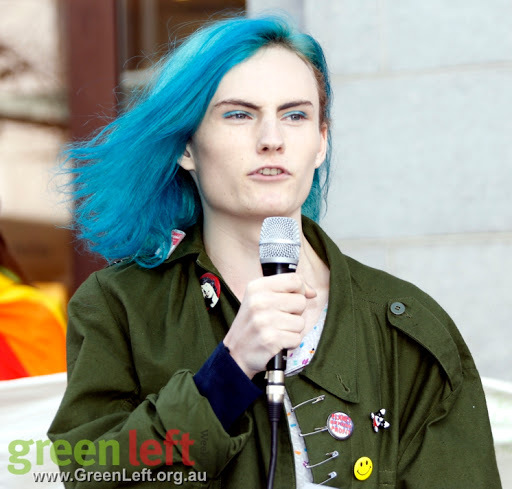 Responding to the counter protest, she said "people who use our nation's name motivated by hate do not speak for the majority of Australians". 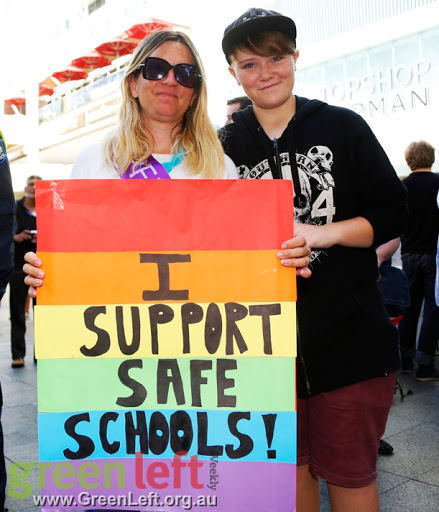 "I support the Safe Schools program because it works," she said. 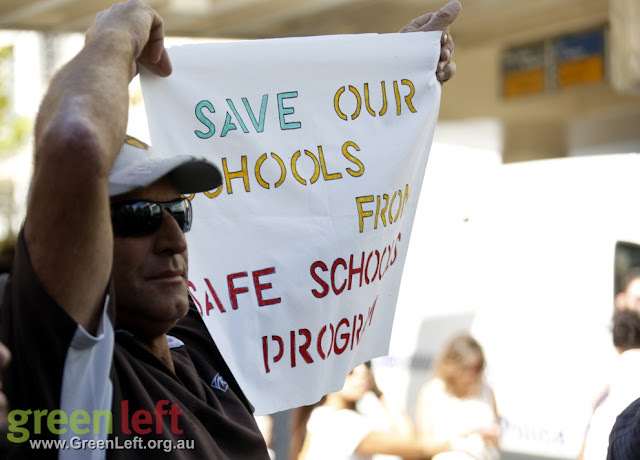 "School leaders, principals, teachers and students have told me that this program saves lives." 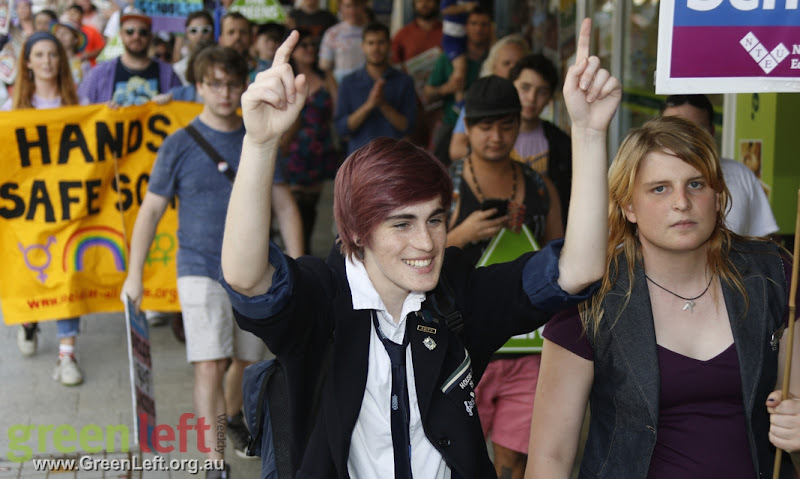 Midway through the speeches, a march took place through the city.